As planned, Kodak has announced its first smartphone with Android OS, the Kodak IM5 with a 13-megapixel rear camera and everything else that a standard Android smartphone would have. Bullitt Group, a company that is known for ruggerized phones, has made this smartphone and it isn’t Kodak doing anything here, except for giving its brand name. Update: 16th June 2015: The device that was announced back in CES 2015, is now available in Europe, first in Netherlands, for a price of €280 without contract, and free on contract with different carriers. While the device doesn’t really have some great camera specs, Bullitt is clear and saying that the IM5 isn’t made for boasting numbers but for those who wanted a good camera experience to the users who don’t want to purchase high-end smartphones only for a decent camera. As far as the specs are concerned, the Kodak IM5 comes with a 5-inch HD display, 1.7GHz Octa-Core processor, 1GB RAM and 8GB internal storage with a MicroSD card slot for storage expansion to 32GB. The smartphone runs Android 4.4 KitKat and the interface does come with some enhancements such as quick shortcuts to calling, messaging and accessing contacts. The device also has an image management software that helps the user edit the pictures and preview them in the device or share them on social media, and with the help of apps, print the pictures directly connecting to the printers in the network. So, the pricing is set at $249 and the phone is set to be available worldwide, with the rollout starting in Europe from the end of quarter 1, 2015. Announcing its partnership with Bullitt Group, an English company, Kodak is all set to make its mark in the smartphone industry with focus on image capturing, editing and sharing options. It will just be the brand name “Kodak” used for a range of smartphones that are to be launched later this year, but the first device will be showcased at CES 2015. 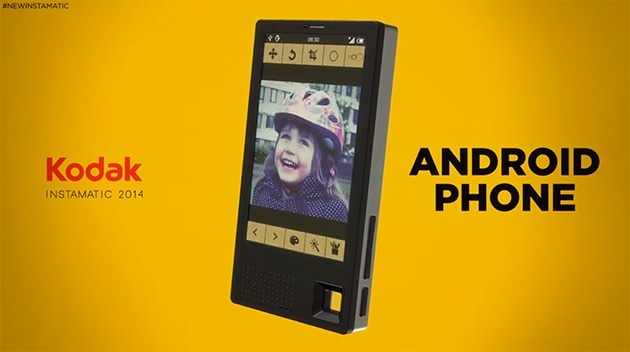 What Kodak has in plans for the second half of 2015, includes a 4G handset, a tablet, and a connected camera. Kodak isn’t doing any of the development by itself, and Bullitt Group will handle all that. What is being shown in the picture is not official, and we really hope it isn’t something in the likes of that design. Keeping the photography editing in mind, Kodak Mobile Devices range is not coming with any compromise in the design and user experience. “We are impressed with Bullitt Group’s commitment to delivering a portfolio of products that embrace the quality and innovation that our brand is known for around the world.”, says Eileen Murphy, VP Brand Licensing, Kodak. We’re at the CES 2015 floor, and would be getting some time to play around with the Kodak’s first Android device with Bullitt Group. Stay tuned!